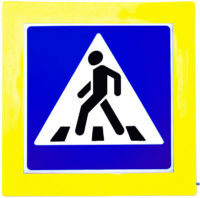 Doublesided illuminated informational VMS «KOMKON ZDPP» is intended for improving of visibility of the road sign «Pedestrian crossing» at night or twilight time. Front and rear panels are made from a polycarbonate. They are highly shockproof and climatic resistant. LEDs brightness adjustment is available. The construction is based on a non-corroded aluminum frame, which provides the sign with lightness and strength.